The Maytag Epic z is an electronic clothes dryer and washing machine that can be used separately or stacked together with various temperature options, fabric choices, a wrinkle prevention mode, timed dry settings, specific item options and a sensor dry and stain feature. The Epic z can be purchased in many appliance, department or home retail stores as well as online and can typically be expected to work well under most circumstances. If you run into problems, some troubleshooting methods may be useful in helping to find the problem source and a possible solution. Examine the household fuses or circuit breakers if the unit is not working, as the Epic z dryer uses more than one circuit or fuse. Replace or reset as necessary. Use a power outlet with 240 volts or more, which you can determine with a volt meter. Close the Epic z door firmly and press the "Power" button for at least one second if the dryer has power but isn't working. If there is no heat, verify that you selected a heat dry option. 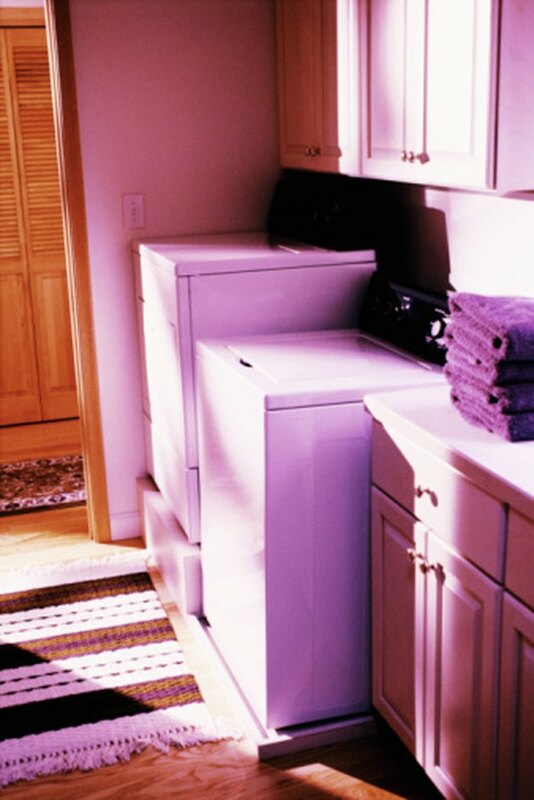 Look inside the dryer for objects that may have fallen out of pockets if there is a clicking or thumping noise. Examine the drum edges and remove items if possible. Separate pieces of clothing inside the dryer if the items got tangled together, and reduce the load size if necessary. Tighten the legs on the dryer if the unit is rocking side to side during use. All four legs should touch the floor evenly. Adjust as needed. Press and hold "Start" if a "PF" (power failure) error code appears. If the code persists, press "Power" and then a new cycle selection. Contact Maytag for help if an error code with an "E" and a number appears on the display. Ensure the Epic z washing machine is plugged into a grounded three-prong outlet if it doesn't start. Shut the lid firmly and press a wash cycle before selecting "Start." Select "Start/Pause" if an error code appears on the display and unplug the unit for several minutes. Reconnect power and choose a new cycle before pressing "Start." Verify that the hose connections are tight on both ends and only high-efficiency (HE) detergent is being used if the washer is leaking. Do not open the washer lid during the wash cycle, as water can deflect off items and splash out of the washing machine. Select "Rinse and Drain/Spin" if the door does not unlock. This removes any excess water from the washer tub. If "Add a Garment" is illuminated, select "Start/Pause" to unlock the door. Verify that you placed the correct detergent in the correct dispenser if the dispenser is clogged or is not dispensing as expected. Wipe out the dispenser drawer with a damp cloth and dry it before adding the correct detergent. Leave the door open after use (if small children and/or pets are not present) if the washer smells badly. Place a laundry cleaning tablet, available at grocery and hardware stores, into the washer and set the washer to the highest temperature wash possible to clean the unit. Set a piece of 3/4-inch plywood under the washer or dryer (or both if stacked) if the machine is thumping or vibrating or the floor seems too weak to support the unit(s). Tighten the feet on the unit and make sure all four feet are level on the ground if there is vibrating or thumping during use. Do not connect the washer or dryer to an extension cord, as extension cords cannot supply the power necessary for the unit(s).